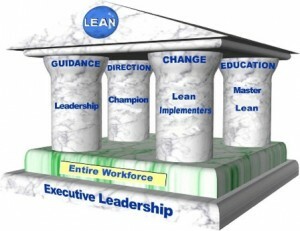 In an earlier post, Roadmap to Successful LEAN Implementations, we discussed the identification, communication, involvement and buy-in of LEAN transformations. Once these preliminary steps have been taken, it’s time to start executing your project! Like any well-run project, it is important to define expectations at the outset: How will customers benefit? Lower prices, faster delivery, higher quality, or shorter time to market are measureable outcomes. At the same time, determine key roles: project champion (preferably the executive having responsibility across the span of the project), project leader, and core team members. Hold periodic (usually weekly) team meetings with a formal action register to capture action items, due dates, and responsible individuals is essential. This establishes an environment of trust, camaraderie and accountability. It is common to have workshops facilitated by a neutral party to map the current processes or states that the project is intended to “lean out” for gaining new efficiencies, such as cost and time savings. These workshops are valuable for capturing the REAL process or state, not what people THINK it is. Additionally, key metrics of the process should be identified and used as a baseline reference. Once agreement is reached on the current state / process, a future state can be articulated, designed, discussed, and reviewed. It is good to have other stakeholders (outside of the core team) to review and detect potential problems in the suggested future state. During this phase, new metrics, or improvement goals, should be identified. When all flaws are fixed, risk mitigation plans developed and metrics agreed upon, it is time to “release” the new future. There are several deliverables throughout the LEAN transformation project, including the action registers for distribution, current state diagrams / process maps, and other project specific reports. At the end of the project, new process maps, process documents, standard work instructions, ancillary templates and forms, and training documents are captured to reflect the new state. All deliverables should be stored in the project repository as well as the company defined work instruction locations, per the company’s quality system requirements. Deliverables include the new metrics and the reporting methods and frequency of them. The new process should be monitored for effectiveness periodically, consistent with continuous improvement practices. In our next blog post, we’ll examine the impacts, results and key performance indicators for Lean projects.